You own a (historical) pianoforte tuned to between 435 and 442 Hz and you are looking out for a unique concept for your music festival, private concert or historical event: we can deliver you formulas fit to mesure. Please contact us to obtain information about prices, programme lenghts and precise details. Les Pantalons and Sophie Dury will draw you back to the private drawing-rooms, small ballrooms and festive gardens in 19th Century Paris. You will hear quadrilles, polkas and waltzes by the king of quadrille Philippe MUSARD, his opponent Louis-Antoine JULLIEN and the Namur composer Jean-Baptiste TOLBECQUE (director of music at the Tivoli gardens and in charge of the balls at the court of Louis-Philippe), alternated with romances and operatic arias by Camille Schubert, Jacques OFFENBACH, Louis CLAPISSON en Luigi BORDESE, amongst others. In the 19th Century, Parisian ballrooms and drawing-rooms were graced by small orchestras. 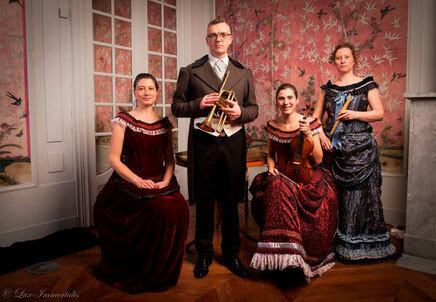 The musicians of Les Pantalons specialized in the very specific instruments of this era (flageolet, piston cornet, violin and pianoforte) and in doing so bring back to life these once highly fashionable ensembles. You will hear joyful quadrilles, waltzes, mazurkas and polkas by the 'Napoleon' of the quadrille Philippe MUSARD, J.STRAUSS 'of Paris', the impetuous Louis-Antoine JULLIEN and the Paris based composer Jean-Baptiste-Joseph TOLBECQUE of Namur. Splendid pianoforte music and enthralling explanations about the instruments, music and scores of this era will complete the picture. 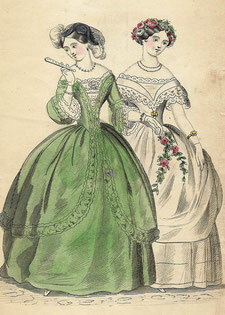 For the performance of this fascinating spectacle, the ensemble Les Pantalons cooperates with historic dance groups. With their splendid costumes, the unique blend of instruments and breathtaking choreographies you will re-experience the festive joys of Parisian ballrooms and drawing-rooms. Between the demonstrations there will be an opportunity to get initiated into 19th Century etiquette and dance steps, lead by a skillfull dance master. You will learn about the different figures proper to the quadrille, waltz, mazurka and polka.